This is a brand new streamlined design and layout for 2017 with a very high specification and is ideal for couples who wish to tour in luxury and comfort and can be driven on a normal car license. 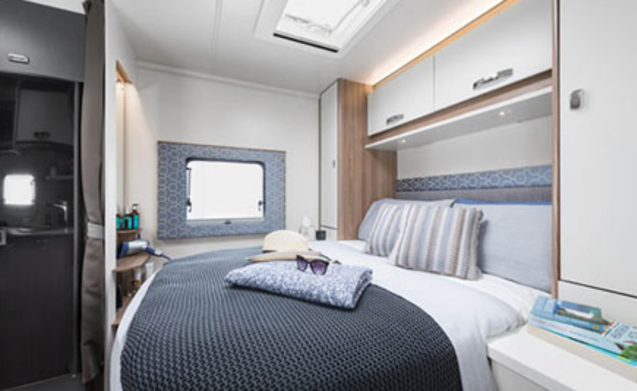 The Skye is 7.4 metres long so is very roomy inside and has been designed for maximum living space. There is a fixed double walk round island bed in the rear at normal height which is made up all the time and can be accessed from both sides, the dinette / lounge seat converts to another double if required. 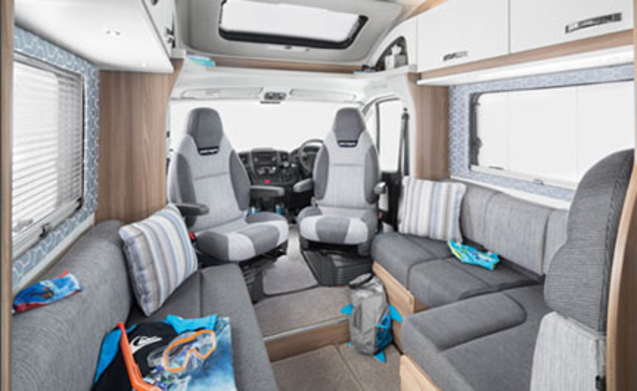 The wrap around lounge combined with the comfortable captain style swivel seats in the cab gives maximum space to relax in the evenings. Automatic Satellite TV System, Fully programmable central heating and hot water systems. full luxury pile carpet throughout, Rear view camera, Parking sensors, Opening Cab Sunroof, Roof mounted solar panels, Air conditioning, Cruise control, Hands free Mobile Phone connection, Satellite Navigation, Full media player system with i pod / i phone blue tooth connection, Microwave, Rear cycle carrier, Black privacy glass windows, All our motorhomes are fitted with awnings so you can all sit outside under cover with the picnic table & chairs (supplied free) and enjoy a barbeque which is also supplied free. 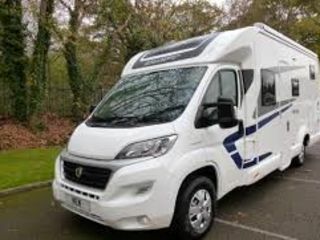 The Skye, unlike many motorhomes, is built on a lowline chassis giving this motorhome a luxury car feel to drive with little or no body roll. 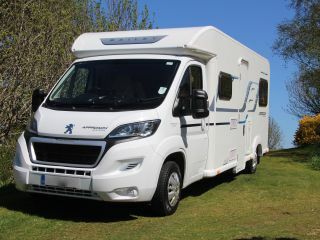 This is the low profile model which does not have the bulbous top above the cab making this motorhome very economical on fuel around 30-34 mpg. 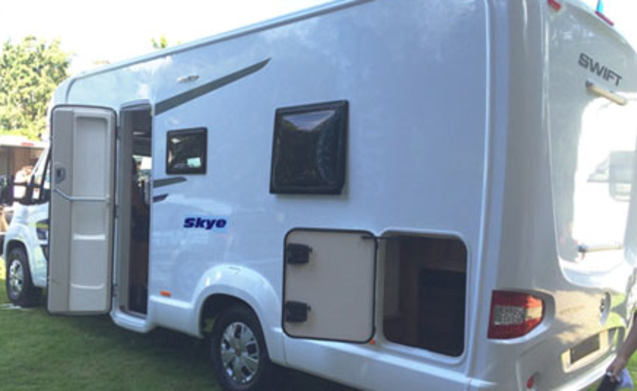 Outside the Skye is fitted with a 4 metre long awning, Included is picnic chairs and table along with a barbecue, water hose, ramps, and mains hook up cable... all stored in the large rear garage. All the habitation windows, doors, and roof lights have cassette blinds and fly screens. The waste water emptying is by push button on the control panel... no fiddling with a messy valve underneath. The rear double bed has a very comfortable memory foam mattress. Being an Island style... access is from both sides so you don’t have to disturb your partner if using the toilet during the night. There are wardrobes either side of the bed along with lots of cupboards to give ample storage. 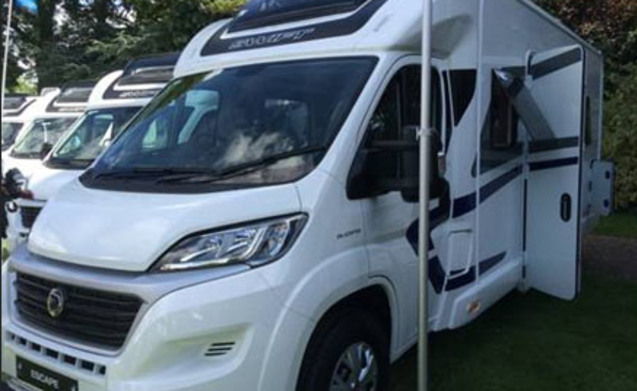 The bed hinges up on gas struts to reveal another large storage area, We fit all our motorhomes with LPG (Autogas) tanks which can be topped at fuel stations so no need to remove bottles for refilling.